Our babies became boys. Boys with skateboards and lacrosse sticks and friends. So many friends. Sometimes I had to press myself against a wall in our small house to avoid being knocked over. Our Boston suburb is green and quiet, with good schools and an easy commute to town. But what we really needed was a farm. A farm with fields where I could send the hordes to release their energy, to throw those balls far from my windows. Where I could plant a raspberry patch and a real kitchen garden, and let the dogs out the kitchen door early in the morning, instead of finding their leashes and putting on my shoes and coat in the dark cold. I would dry herbs in my 19th century farmhouse, and keep a goat in the barn. And I would have a chicken coop. But my family wouldn’t hear of it. “I’m not leaving my friends,” said each of my three sons. “I’m not driving from the airport all the way out there late at night,” said my husband, an architect who travels a lot. And then I discovered that the idyllic, historic farming town I had chosen for our family’s next chapter didn’t have any take-out dinner options, not a single one. I surrendered. Instead, I would have to find a bigger house our suburb, where all the farms are long gone. I gave up my farm dream on a Friday – and on Sunday a friend (and realtor) alerted me to a new listing, a house she had thought about buying herself. A farmhouse, just a few blocks away. The house was built in 1850 in a bit of pasture bought from a local farmer by Mehitable Robinson, a “single woman” according to an article about the house published in the 1940s. Mehitable built a simple four-room cottage in the farmer’s fields. A stream trickled past it and beyond that, she built a barn. She placed her house at the high point of her land, two rooms below and two above, with windows facing the south. Sunlight fills and warms the main room, with large windows of watery, antique glass framing flower beds.. In a gray dawn it’s not hard to see the apple trees and pastures that once surrounded Mehitable’s house, and to hear cattle lowing. The single woman married, and her house was entered in the town’s records under her husband’s name: the Pomeroy Farmhouse. Four families moved in over the next 150 years. 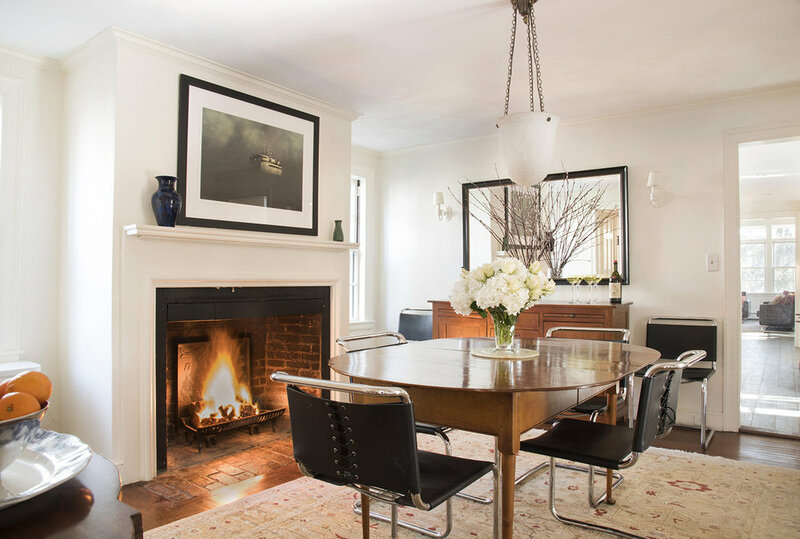 One expanded the cottage by turning her kitchen into a formal dining room with a Rumford fireplace, and adding a large kitchen to the end of the house. The two first-floor rooms were joined into a gracious living room with another large fireplace. Another owner took down the barn and re-used the wood to build a wing beyond the kitchen, with a garage below. A child who lived here planted every one of his family’s Christmas trees, ringing the house with spruce trees, now towering sentries. By the time our family came along, the farmhouse was exhausted by 156 years of hard living. “We bought the Boo Radley house,” my husband told friends. Surrounded by expensive, well-kept neighbors, the house frightened potential buyers with peeling paint on original clapboards, an aging roof, and an iffy spot on its foundation. Middle-schoolers cut through its garden on their way home, unintimidated by dilapidation. But the house was large, with a bedroom for every boy. And the backyard was enormous, a place where balls could fly without doing any more damage than landing in the neighbor’s pool. It had a vast basement that could absorb snowboards, fishing poles, and all the boxes of children’s books I’m saving for someday grandchildren. With some coaxing of the town’s health department, I could even keep chickens. And my husband, the architect, eyed the foundation, the scuffed floors and dreary paint colors, and said, “We can fix that." We moved just in time. The years of teen sports and parties were upon us. The house became ground zero for team dinners, pig roasts for graduations and engagements, games of charades on Christmas afternoon, and end-of-summer clam bakes. Our friends and the boys’ friends could have parties simultaneously, cross-generation conversations in every room, and everyone in the kitchen helping me cook. One day, a son and best friend were wasting time in the back of math class at Belmont High School by drawing a map of the town in the style of Tolkien’s map of Middle Earth, the endpapers of The Hobbit. Here was the high school as Mirkwood, where if you strayed from the path, you’d be lost forever. There was Mordor, the home of a girl who had dumped them both. And the Shire, the fruitful, beloved land of the hobbits, was our house. I loved that, for it’s all I really wanted out of a farm: A generous, contented place in which everyone could till their lives, emerging as adults one by one. The Pomeroy Farmhouse became the Shire. We kept working on the house, getting something done every year: a new roof, a new driveway, and energy-efficient windows. We turned the garage at the back of the house into a large, ground level room for teenagers that opened to the backyard. We upgraded the electrical system and plumbing, put in a new water heater, and fenced the yard for the dogs. Eventually, when one son, AKA Mr. Six-Egg-Omelet, left for college, I traded my chicken coop for a bluestone terrace for summer dinner parties. The skilled Italian mason who built it fixed the iffy bit on foundation, too, with some gratis artistic brickwork. Finally, we rebuilt the whole back wing of the house, installing a gracious, yet highly functional kitchen with a soapstone island and walk-in pantry, and an enormous, light-filled family room with a cathedral ceiling. The barn from which it was originally built was memorialized in Italian tile that perfectly mimics reclaimed barn wood. No longer full of lacrosse players taking shots on goal, the backyard seemed empty. Our youngest and only son still at home, said, “Let’s put in a swimming pool!” I resisted until my husband opined that a pool would be a magnet for the guys and their friends. Fine, I said, but it would need to be a pool that looked as if Mehitable had owned it. So, we put in a mill pond – a filtered, heated millpond – surrounded by wildflowers and native grasses. And the ploy worked. April to October, the boys and their friends made our pool their gathering spot. Just as welcome, the butterflies discovered the native plants beside water, and bats flick by at dusk. Yesterday was book day. We hired Alex, a musician with biceps and patience, to clean the Augean Stables, AKA our vast basement. He brought up box after box after box of books and stacked them in the sunroom. Because, twelve years later, we’re moving again. Our youngest is a sophomore in college. We told him we were thinking of moving back to town after he graduates, perhaps a couple years after that. He said, “If you move back to the city now, I might come home more often.” Oh. I called my friend, the realtor. While we miss having the boys around, we thoroughly enjoy ourselves without them. We work late because we can, and then meet up for a cocktail afterward. We have riotous dinner parties on the terrace and guilt-free dinners in front of the TV. If we miss one of our far-flung sons, we fly to see him. I love the empty-nest stage of life. But I don’t love the nest when it’s empty. A home in the city has grown in my mind just as the idea of a farmhouse once did. So, Alex cleans the basement as we prepare to put the Shire up for sale. And I stand in the sunroom heaped with boxes of books. It occurs to me I might be a hoarder. The addiction may be limited to books, but it’s clearly more severe than I ever realized. My task is to decide which of easily a thousand children’s books I will read to my grandchildren, who do not yet exist. Which novels I’ve read but want to keep so that I can press them into someone hands, saying “you must read this.” We’re moving from over 3000-square feet to half that, or less. And my husband, the architect, has limited patience for cluttered bookshelves over clean, white walls. I must be resolute and severe. I spent all of yesterday picking up, dusting off, and considering each book. Does it go in a keep box or a toss box? Some decisions are simple. How and why did we acquire so many coffee table books about sea creatures? But most of my Sunday among the boxes is one Proustian moment after another. Here it is; the book that my eldest child, at the age of three, picked up off a 50-percent-off table and carried like a favorite stuffed animal for years: The Anatomy of Aircraft: 85 Years of Years of Development from the Wright Flier to the Grumman X29. Yes, he’s an engineer now. A full box of books of ghost stories brought back nights on the porch of the house on Martha’s Vineyard we rented every summer. Here is Ed Emberley’s Go Away, Big Green Monster!, bedtime reading requested night after night by another three year old as he screwed up his courage for something I’ve forgotten or never knew. I put these books in a “keep” box. We think of books as taking us into other places, times, other people’s lives and stories. But the books we keep, these books tell our own stories. This morning, 65 boxes of books wait by the front door for pick up by the social justice nonprofit More than Words. And 30 boxes of books are going back into our now perfectly clean and organized basement to come along to the new house. They will bring our life here, in this beloved house, along with us. When I kept chickens at the Shire, the first welcome egg told me spring was coming. The hens took their annual break from laying as daylight dwindled in November, and started back up again in early February, with surprised squawks. After first eggs come snowdrops, then crocuses, which herald daffodils, and then we’re off to the races. The garden at the Shire tumbles in one bloom after another through spring and summer. Deadheading the asters in October, I can’t believe how much has happened in the garden since March. The Shire has always been a farm, so the soil is rich with organic matter and well-settled societies of beneficial microorganisms. My hens were the last in a long line of chickens, and probably a milk cow at one time, nurturing the ground around the house. Put something in this ground and it grows. So, from March to October, I look after my gardens. Not that they’re fussy and require a lot of nurse-maiding. That excellent soil does most of the work keeping the plants healthy. But I’ve also stuck to New England native plants that take care of themselves: Joe Pye weed, River birches, and wild grasses. The property has sunny spots, shady spots, a wet place and dry places. So, the gardens arranged themselves accordingly around the house. The first garden is up by the street where 100-foot tall Shagbark hickory lords over the house. There aren’t many Shagbarks left in New England; they were all chopped down to make axe handles. Lily of the valley and as many different hostas as I could find form a thick carpet at its feet in the spring. A brick path winds between the hickory and the Henry Lauder’s Walking Stick (winter interest!) and under the climbing rose tangled with clematis into the perennial garden. A perennial bed should be formal and kept, but I love a blowsy cottage garden, and hate to cut back an enthusiastic aster just because it’s covering the path. I also favor volunteers, the plants who plant themselves. If a Virginia bluebell decides to plant itself in a gap between the bricks in the middle of the path, who am I to step on its dreams? Follow the path into the shade under the pear trees and look to your right. If it’s April or May, a tiny woodland wildflower garden will be there: Trillium, mayflowers, bloodroot, columbines and Jack-in-the Pulpit. Open the gate and you’ll see the berry patch and beside it, the kitchen garden, fenced to keep the dogs out. True confession: I might have overplanted the raspberries; there’s only so many tarts any family will eat in a season. The kitchen garden grows where I once kept my chickens, so the soil is super-charged. Lettuce, herbs, and peas are extremely happy here. As in the cottage garden, I have a hard time pulling out tomato seedlings that have confidently planted themselves from last year’s dropped fruit. Concord grape vines cover the fence. I haven’t seen any grapes yet, but harvest the large leaves to decorate cheese platters. The bluestone terrace beyond the kitchen garden has pots for annuals, and little lights overhead. It’s the viewing area for the garden around the pool – and party central in the summer. Grilling happens here, and lots of laughter with Limoncello under the lights late into the night after a summer barbecue. I didn’t want a swimming pool, but when the family said, “It’s not really a pool. It’s a garden with a water feature,” I succumbed. So yet another garden nearly surrounds the pool. And, this is my favorite garden of all. On the far side, stones gathered from the beaches on Martha’s Vineyard form a shoreline. The boys and friends have dropped off more stones found wandering beaches in Big Sur, Iceland, and Maui. Meadow plants spill over the stones: Birches, grasses, sunflowers, Queen Anne’s lace, and a wild rose. (And behind that garden, under the spruce boughs, a gardener can hide with a book on the hammock.) In the far corner, the garden dresses up as a marsh, suggesting the source of the spring for the pool: Rose mallow, grasses, and irises. A patch of elephant ears surround the dive rock, a reclaimed slab of granite that once served as the front stoop for a 18th century home. Saying goodbye to a garden, I find, isn’t at all like saying goodbye to a child heading off to college. I worry more about the garden. Has the magnolia recovered from that droughty summer? Does the Japanese maple need pruning? Where will the hollyhocks show up next year? And what will all long-lived, slow-growing plants garden I’ve planted look like after I’m gone? After 12 years, the Henry Lauder’s Walking Stick is just coming into its own, its black curly-cue stems dramatic against snow. The dwarf pines have years to go until they reach full height. I realize now that I’ve planted them for another family, for the next gardener. And feel the same relief I felt when each of my sons fell in love: She will look after him now. The wisteria vine twines around the rails of the kids’ tree fort. Someday, it will tangle itself into a roof, a purple tent high in the spruce for the next set of children who live at the Shire.